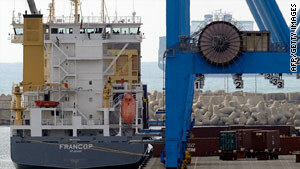 The U.S. says the Francop, shown at the Israeli port of Ashdod, carried 36 containers of arms and related materiel. United Nations (CNN) -- The United States and other envoys at the United Nations slammed Iran on Thursday for transporting arms and ammunition to Syria, saying the clock is ticking for the Islamic republic -- which could face tougher sanctions next year over its nuclear program. "Patience is running out," said British Ambassador to the United Nations Mark Lyall-Grant. "If there is no change of approach, then clearly the Security Council will need to look again at further sanctions against Iran in the new year." In a statement delivered to the U.N. Security Council, U.S. Ambassador to the United Nations Susan Rice dwelled on three reported incidents over the last year regarding the munitions transfer, all involving the Islamic Republic of Iran Shipping Lines. "Iran has now been caught breaking the rules -- repeatedly," Rice said. "The illicit smuggling of weapons from Iran to Syria is not just a sanctions violation; it is also an important factor in the destabilization of an already fragile Middle East." U.S., British and French envoys told CNN that Western envoys fear that Iran is intent on developing nuclear weapons -- a claim Tehran denies. Their concerns fester as the U.N. Security Council's permanent members consider tougher sanctions on Iran amid the recent International Atomic Energy Agency report underscoring the country's refusal to cooperate with the nuclear agency. The report points to Iran's expansion of enrichment and heavy-water-related activities and the construction of a secret enrichment facility near the city of Qom. Rice cited the stopping of two ships -- the Francop and Hansa India -- over a 90-day period. The United States stopped the Hansa India, and Israel stopped the Francop. Both ships were allegedly smuggling arms to Hamas and Hezbollah. "The scope of these violations is alarming," Rice said. "On board the Francop were found 36 containers of arms and related materiel, including 690 122mm rockets, around 12,000 anti-tank and mortar shells, more than 20,000 fragmentation grenades, and more than half a million rounds of ammunition. Tons of bullet casings were found on board the Hansa India." Rice said "all states should give extra scrutiny to all shipping between Iran and Syria, especially if the Islamic Republic of Iran Shipping Lines is involved," and U.N. sanctions must be rigorously "enforced to ensure that destabilizing weapons are not allowed to flow from Iran to other parts of the Middle East and elsewhere." "The discovery of the Qom facility, Iran's announced intention to build new enrichment plants, and Iran's prohibited arms transfers underscore the renewed urgency of full and robust implementation of Resolutions 1737, 1747, and 1803," Rice said in a statement delivered to the Security Council. "Member states need to redouble their own enforcement efforts, and the 1737 Committee [a sanctions committee] should be more vigilant, engaged, and active. More rigorous implementation of these sanctions will make it harder for Iran to acquire the technology and assistance to support its prohibited proliferation activities. "It will make it harder for Iran to smuggle weapons to extremists and nonstate actors. It will make it harder for Iran to abuse the international financial system to fund its proliferation activities. And full implementation will make it harder for Iran to build any more covert nuclear-related facilities -- such as the site near Qom -- beyond the gaze of international inspectors," her statement said. The United States says it is willing to remain engaged with Iran and work toward a diplomatic solution to the nuclear issue before tougher sanctions are considered. However, Rice told reporters that "time is short." "Engagement cannot be a one-way street. Iran must conclusively demonstrate a similar willingness to engage constructively and address the serious issues associated with its nuclear program," Rice said at the Security Council. French Ambassador to the U.N. Gerard Araud, speaking to reporters outside the Security Council chambers, said "We are now convinced that there is a deliberate attempt by Iran to violate the U.N. resolutions." He said all efforts to work out an agreement with Tehran have failed, but the Security Council will make a last-ditch effort for negotiations before seriously proposing sanctions. "Iran is violating the obligations they have taken. Iran is violating its international commitments," Araud said. "I think you can see that there is clearly this pattern of violations of international obligations, and an unwillingness of Iran to negotiate with the international community over the nuclear issue," Lyall-Grant said. Iran seeks release of arms dealer facing sentence in U.S.